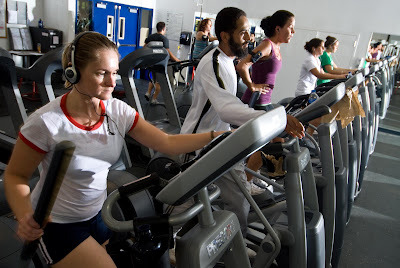 Guest Blog: How Is Cardio Workout Plan Beneficial For You? Cardiovascular exercise, or cardio, is a type of exercise that increases one’s heart rate and blood circulation throughout the body. In all exercise plans, cardio workouts should be included because not only is it beneficial for one’s cardiovascular system, but also it is effective in helping one lose weight by burning off those calories and pounds gained. Engaging in any physical activities, particularly cardio exercises helps you burn calories. This means that the more intense the activity is, more calories will be burned which in effect, helps you shed off those unwanted fats and flab. Nonetheless, cardio exercises are not all about losing weight. In fact, there are many reasons why incorporating and performing cardio routines are beneficial for you. One of the benefits of cardio exercises is that it helps improve your heart’s health. Just like any other muscle, your heart needs to be pumped up and worked out in order to be strong. Keep in mind that the stronger your heart is, more blood is being pumped during contractions, thus lowering your heart’s resting rate. Every time you exercise, oxygen is delivered to your body tissues which help your cardiovascular system work more effectively and efficiently. In return, your heart and lungs function normally and more effectively as well, thus giving you enough energy to help you last through the day. Aside from improving your physical condition, cardio workouts can also provide you with stress-relieving benefits. Whenever you exercise, feel good hormones are released in your body. As a result, any forms of depression, stress or anxiety are decreased, giving you a more positive outlook in life and improved self esteem. Another advantage of conducting cardio exercises is it helps increase your metabolism rate, which in turn makes it easier for you to lose and maintain your weight. One benefit of doing cardio activities is it helps promote better and deeper sleep, giving you a more relaxed feeling the following morning. Also, performing cardio exercises regularly can help boost your confidence by feeling good about yourself and your appearance, knowing that you are losing weight and maintaining a healthy body. Regular exercises can also help increase sexual arousal among women and reduces the possibility of experiencing erectile dysfunction among men. After your lifting sessions, get onto a treadmill for a walk or light jog to reduce delayed onset of muscle soreness and at the same time, bring more oxygen to the muscle tissue which can help you get back faster and be able to work again on those muscles. Apart from all these benefits, cardio workouts such as running, biking or swimming are fun activities to do which not only helps you lose weight, but also improves your physical body and mental health as a whole. Felix Ankersen is a health and fitness enthusiast as well as an author for All Workout Routines. His research and writing focus mainly on home exercise routines.